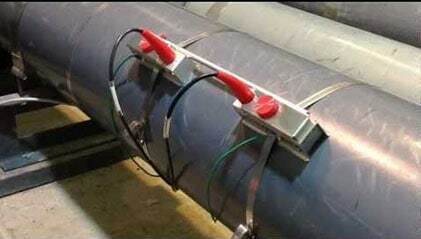 The BM ultrasonic transit time flow meters TTFM 100 NG (new generation) use a coupled pair of ultrasonic transducers to measure the flow rate of a fluid under pressure inside a pipe. AC and DC supply: 110-230VAC and 12-36VDC; battery supply, depending from the type of device. LLB- PTTFM2000-NG can be supplied by solar panel too. The time difference during the measuring process could be 0.2 ns. Analog (4-20 ma), pulses (relays), frequence (OCT) and RS485 MODBUS or RS232 outputs. Serial communication interface RS485 MODBUS (model TTFM100-F1-NG & TTFM100-F18-NG). Serial communication interface RS232 (Hand-held type TTFM100B-HH-NG).